Although a month has passed since we left Tuscany and all there that is so dear, it seems like an instant away. The memories are as vivid as the purple grapes sagging from the vine. This was a spectacular year. We started driving south from the airport for the first time in years and took Cathy to some of our wonderful past memory places. We drove to Naples and stayed first in Herculaneum visiting the ruins of Vesuvius’ horrendous eruption long ago. Then to the peace and dark night beauty of Paestum, the ancient Greek ruins. Then on the precipitous Amalfi Drive to Amalfi where we enjoyed, fish and more fish, the village, history, art, hand made paper and the glorious Don Alphonso restaurant in Sant Agata sui due Golfi. so blessed to have them for friends. So we had two wonderful weeks doing our favorite haunts. Our granddaughter Jenny joined us for ten days and we got to see Italy through her young eyes. What a thrill. 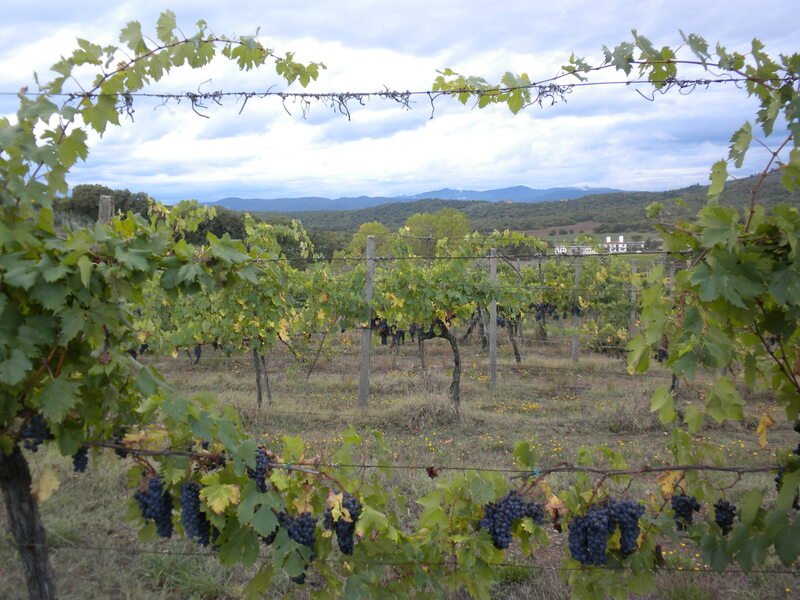 Coltibuono, La Verna, Monsanto, Monterchi, Arezzo, Pienza, Mont Oliveto, the country side, picnics, wine tasting…the whole beautiful thing! 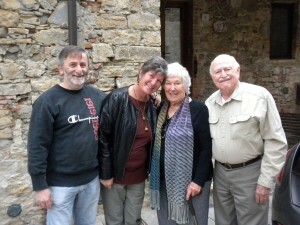 Cathy took her to Florence and Siena, while Jerry and I loafed, cooked, lunched and read. A highlight of the trip was getting to show the book to three of the people whose venues are featured. Laura Bianchi of the winery Castello di Monsanto, Roberto Stucci Prinetti of Coltibuono and Mariangela Betti, Director of the Museo Civico in Sansepolcro, where some of Piero’s important works are housed. what wonderful responses I got…so gratifying and encouraging. Each has written a great statement for the book jacket. We closed visiting Castello di Montegufoni, one of the places where, during World War II, the great art treasures of Florence were hidden, to keep them from being stolen by the Germans, or blown up by the advancing allies. We stood in the ballroom where long ago Botticelli’s Primavera leaned against a wall and marveled at the whole story of that effort to save Florence’s patrimony. Today you can stand in the Ufizzi before the Botticelli and think about the journey she made in an old truck, over dirt roads in the dark of night to her resting place for the duration of the war. And, as always, we must say “Ciao.” It is so difficult. But as long as we can dream and plan, Jerry, Cathy and I have committed to do just that. Another year, another airplane, another trip to say, “Buon giorno” to Tuscany.